’S e siùcar an t-ainm coitcheann a th’ air stuth milis a gheibhear à cuilc an t-siùcair, no às a’ bhiatas shiùcarach. Faodar bathar a chruthachadh às a’ bhiatas shiùcarach agus à lusan eile, anns a bheil sucros na phrìomh thàth-chuid. Anns an aon teaghlach ri sucros, gheibhear glùcos, fructos (siùcar à measan) is siorap arbhair a tha air an cleachdadh le gnìomhachasan a’ bhìdh. Thathar a’ tarraing nan stuthan siùcarach sin à caochladh seòrsa lusan, mar as trice ann an cruth sioraip. ’S ann ann an eileanan àird a deas a’ Chuain Sèimh a tha tùs-àite cuilc an t-siùcair. Bho an sin, sgaoil an lus tro Àisia na h-àird an ear-dheas gus an do ràinig e na h-Innseachan. Mu 2000 RC, thòisich cultar an t-siùcair anns na h-Innseachan ann an àird an ear-thuath a’ mhòr-roinn, far an robhar a’ dèanamh siùcair às a’ chuilc. Dh’fhoghlaim muinntir nan Innseachan mar a dhèanadh iad gràinneachan tioram à sùgh an t-siùcair mu thimcheall na bliadhna 350 no ri linn Ìompaireachd Gupta. Bho na h-Innseachan, shiubhail cuilc an t-siùcair agus an siùcar fhèin tro Phersia, agus chun na h-Èiphite far an robh na h-Arabaich ga ghnàthachadh. Ràinig e Sìona mun àm sin cuideachd ach mun do ràinig e Sìona, bha na Sìonaich a’ cleachdadh siùcar na dhrùis mhilis (siorap) oir, a rèir choltais, bha e na b’ fhasa a ghiùlan anns a’ chruth sin. B’ iad manaich Bhudhach a thug leotha innleachdan ùra an siùcar a chur na ghràinneachan criostail. Le bhith a’ cleachdadh dòighean dèanaimh às na h-Innseachan, b’ iad marsantaich Arabach a’ chiad fheadhainn a chuir air bhonn planntachasan is fìneadairean siùcair. Mun àm seo san Roinn-Eòrpa, cha robh siùcar aithnichte don mhòr-shluagh, ged a bha iomradh ga thoirt air bho thaobh leigheas, ach chuir saighdearan Eòrpach a bha a’ sabaid san Ear Mheadhanach, eòlas air agus bheireadh dhachaigh leotha e an dèidh cogaidhean a’ chreideimh. 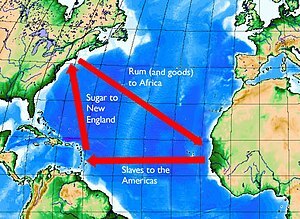 An "Triangular trade" - dh'ion-phortaicheadh tràillean dhan Roinn Charaibeach airson obrach ann an tuathanachas siùcair. Mu thimcheall 1390, dh’inntrigeadh dòigh fàisgidh na b’ fheàrr a thug comas dhaibh dà uimhir a bharrachd de shùgh fhaighinn às a’ chuilc. Rè nan linntean a lean sin, stèidhicheadh planntachasan siùcair ann an àird a deas na h-Eòrpa, ann an Ameireaga a Deas, anns an Roinn Charaibeach (Innseachan na h-Àird an Iar) agus iomadh àite eile. Bha an bàrr gu mòr an sàs gnothach tràilleachd thar a' Chuain Shiar, oir a bha feum mòr air obair aig tuathanachas siùcair agus bha bàsmhorachd nan tràillean glè àrd; mar sin b' fheudar an ath-sholar. 'S e Triangular Trade ann an ainm rian malairt tràillean às an Afraga, siùcar às an Roinn Charaibeach agus ruma is saoithreachadh às an Roinn-Eòrpa is Sasainn Nuadh. Dh'adhbharaich droch-ghrèidheadh nan tràillean Rèabhlaid na Haiti agus aramachan eile nan tràillean. Mhair duilgheadas gu leòr mu chumhaichean obrach. Tha film ann, The Price of Sugar, mu dheidhinn dubh-shaothrachaidh obraichean na Haiti anns a' Phoblachd Dhoiminiceach. Mun 17mh linn, bha malairt an t-siùcair a’ sìor fhàs mòr, agus bhathar a’ cleachdadh innealan ùra airson a dhèanamh. B’ iad an Fhraing ri linn Napoleon Bonaparte agus a’ Ghearmailt gu sònraichte a thug leasachadh mòr air dèanamh agus giollachd an t-siùcair. Air a tharraing à "https://gd.wikipedia.org/w/index.php?title=Siùcar&oldid=527688"
Chaidh an duilleag seo a dheasachadh 5 dhen Ghearran 2017 aig 17:15 turas mu dheireadh.